Photo by Cory Paul Hill. Front Row (left to right): Dan Martin, Inclusion Coordinator (Anglophone), Veronique Arsenault, Denise McWilliams Sophie Pitre-Boudreau, Inclusion Coordinators (Francophone) and Erin MacLaggan Executive Director, Unicorn Children’s Centre. Second Row (left to right): Keelan Lewis, Student, Rothsay Park School, Lorena Joseph, Lorraine Whalen and Julia Murray, Educational Assistants Team at Harcourt School, John Jory (accepting on behalf of his father, David Jory) and Al Dewitt, Department Head, Metals Processing, New Brunswick Community College, Moncton. Back Row (Left to right): Rhéal Hébert, Physical Education teacher, Grande-Digue School, Sara Creighton, Resource and Methods teacher, Dr. A.T. Leatherbarrow Prtimary School, Cynthia MacInnis, Karlene Milson, Lori Wall, and Kathy Arsenault, Inclusion Facilitators (Anglophone) and Eric Levesque, Inclusion Facilitator (Francophone). 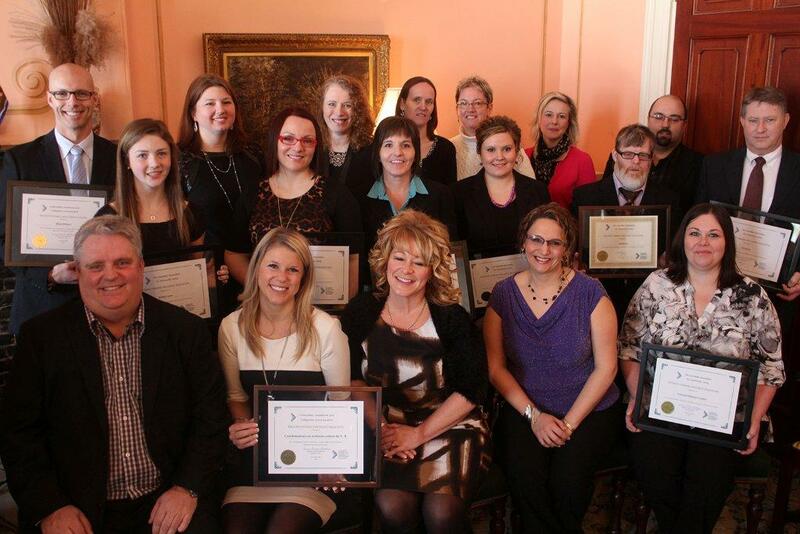 (Fredericton, NB) – Six 2015 Inclusive Education Awards and two Special Recognition Awards were presented during a ceremony at Government House today. Originated by the Canadian Association for Community Living (CACL), the awards recognize New Brunswick individuals, schools and organizations that work every day to include all students in education and school life, and are the focal point for celebrations marking National Inclusive Education Month. Her Honour Jocelyne Roy Vienneau and NBACL president Dianne Cormier Northrup presented the awards to recipients representing the continuum of inclusion throughout the educational cycle, including: a team of educators at an early learning and childcare centre, a resource teacher at a primary school, an elementary classroom teacher, a team of educational assistants at a community school, a middle school physical education teacher, a Grade 8 student, and a community college instructor. The two special recognition awards were presented to a long-standing member of the NBACL community who began advocating for inclusive education when NBACL was first formed and the French and English teams of Inclusion Facilitators who received special assignment from the NB government in 2012. “We thank those who have worked, and continue to work, diligently to protect and uphold the rights of all students,” said Ms. Cormier Northrup. Founded in 1957 by parents whose children were not legally allowed an education in our public schools, NBACL has evolved over the past 58 years and now works on initiatives that touch almost every aspect of the lives of people who have an intellectual disability. From the Harcourt School, three educational assistants, Lorena Joseph, Lorraine Whalen and Julia Murray, whose team approach to inclusion is grounded not only in their dedication and love for the children they work with, but also in their professionalism and their continuous pursuit of education and support from other practitioners in the field. From the Grande-Digue School, Rhéal Hébert, a physical education teacher whose desire to include students with a disability in the activities in his class has led to a parasport program in which students both with and without a disability participate. In Moncton, Unicorn Children’s Centre, an early education and child care centre where every child is accepted and included unconditionally in the daily program. At Unicorn, inclusion is not just a policy, it is an inherent part of everyday practice. Also in Moncton, Al Dewitt, an instructor in metals processing at the New Brunswick Community College, whose long-standing and continued support of inclusive practices has helped many students with a disability achieve their goals, and has inspired the other departments at the college to benefit from inclusion in their programs, as well. From Rothesay Park School, a grade eight student, Keelan Lewis, who has become a role model for her entire school because of her respectful and kind interactions with all her school mates with a disability, and whose close friendship with a girl with Down Syndrome has shown that people with a disability can have rich relationships with their peers. David Jory of Saint John, who has worked tirelessly on inclusion for people with an intellectual disability since NBACL was first established. Because of Dr. Jory’s efforts, huge strides have been made in securing an inclusive education for all children. Dr. Jory’s son, John, who has Down Syndrome and is now an adult living on his own, accepted the award on his father’s behalf. The English and French teams of Inclusion Facilitators, dedicated New Brunswick educators recruited by the NB government to move the inclusion mandate forward. The members of the teams were identified because of their demonstrated commitment to leadership in inclusive education. They have been the critical catalysts for supporting ongoing change and strengthening school knowledge, teacher skills, and the education system’s understanding of inclusive education.